As they say, “Information is power,” and I’ve spent much of my career consuming various books to inform myself on a variety of topics be they technical or management or leadership. I have hundreds, may be thousands of books either in paper or electronic form that I’ve read over the years. But it’s not really a lust for power that I’m after. But I’m constantly seeking to improve. As a result, I share what I learn with others, and actively mentor young engineers and teens. I think it’s important to share what we learn throughout our lives. It just improves life for everyone around us. One of the subjects about which I’m passionate is leadership. Leadership isn’t just leading people and telling them what to do. True leadership comes from the inside; from what you value, from what you’ve experienced. And one critical aspect of true leadership is authenticity. 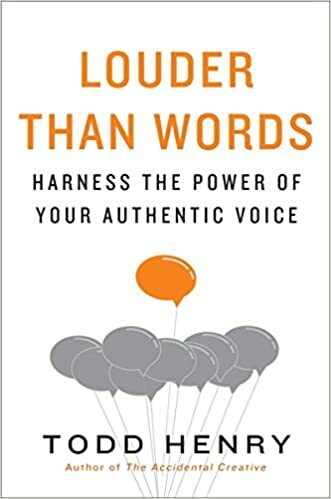 That’s where the book I’ve shared, “Louder Than Words,” comes into play. I’m still in the middle reading this book; truth be told, I’m only through the first few chapters. But as I was reading it today on the first leg of my return trip home from India, a conversation I had with a friend a few years ago surfaced in my mind. It wasn’t that the conversation was long and drawn out, but the nature of the conversation stuck with me since then. Basically, the conversation revolved around songs that I should play in my restaurant gigs. My friend is a big Michael Buble fan, and also a young country fan. In our conversation, he was kind of pestering me about doing Michael Buble tunes and some country tunes. At the time, I tried to brush him off a little, saying that while the artists he was mentioning were certainly successful, I just didn’t like them enough to cover their songs. But my friend just wouldn’t relent. Being a salesman, and a good one at that, he wouldn’t take no for an answer. I finally just put my foot down and asked him to please stop with the suggestions. I explained to him that as I didn’t really get into Michael Buble or country, even though I could cover any of the songs he suggested, I just wouldn’t feel authentic. I have to like a piece of music well enough where I could truly “own” the song, and perform it coming from my heart. I don’t do superficial or shallow. I realize that I took a while with the backstory to what I really want to talk about, but it really does relate. For me, I didn’t learn musical instruments just to sit in my bedroom and collect gear. I learned instruments to play music and share it with others. I’ve been performing in one form or another for over 45 years. When I was younger; especially in my teens and early 20’s, I will admit that I was a bit of a copycat. I want to play or sing the music exactly how the original artist did it. But as I got older and started to get a lot of gigs, I realized that I was selling myself short by not being authentic; by not taking that change on myself to express a piece of music in my own way. And that’s basically the crux of this post. Are you being authentic? Are you even interested in being authentic. Personally, I have not judgement on people either way, but authenticity – or lack thereof – is easily detectable. For instance, during my week and a half long stay in Pune, India recently, my associate and I frequented a great open-air restaurant next to our hotel; mostly because it was convenient and had great grilled meats, but also because they had live music on some nights. On one of those nights, they had a blues band playing. It was a simple trio with a 20-something guitarist doubling as the lead singer. The kid had a great voice and he really could play the blues. The first song they did, he did a 10-minute solo that seemed to be a distillation of Gary Moore, SRV, and some BB and Albert King thrown into the mix. The solo was absolutely spectacular. Enough complexity and sophistication to pique the guitarist in me, but simple and melodic such that I wanted to hear more. That solo just felt like the kid had a story to tell. But as the band got deeper into the set, the kid just seemed to pull the same patterns he used in the first song and apply them – albeit in different keys – to the solos of the subsequent songs. My mate and I finally left after they’d done about seven numbers. He even said, “It’s getting a bit monotonous.” I replied, “Yeah… after the first song, I pretty much saw all his tricks.” We had a bit of a chuckle but we talked about it on the way back to the hotel. I said what was disappointing for me was that while the kid obviously had talent and skill, in the end, he just came off as inauthentic. It was clear he studied the blues greats that he was obviously emulating, but he didn’t turn what he learned into something that was authentically his. BB King was the master of the single note solo. This kid could do that in spades. But he overused it. He did it in every song. Most people who aren’t musicians might not catch that, but as my associate mentioned that it was getting a bit monotonous, he might not have been able to place a finger on exactly what it was that was monotonous, but it definitely wore on him. Am I advocating not learning patterns? Absolutely not. But as a one my teachers once told me, “You learn patterns and scales so that you know your way around the fret board. But in order to truly improvise, you use those patterns and scales as simply part of your musical vocabulary.” Every song has a message. So every song requires a different part of the vocabulary. Just like we use the word “the” in our daily speech. There is a “the,” or common words, in music as well. There’s nothing wrong with that. But it’s the overall phrasing, not the individual words that matter. If all you’re doing is throwing together the same words and phrases, what you’ll be saying will ultimately be gibberish. And this is where authenticity comes into play. When you perform authentically, you say things in your own way. I’ve been teaching my sons who play guitar and ukelele respectively. Both have asked me about improv or even just “owning” a song. I gave them each a simple exercise. Take four notes or chords (with the chords, they should fit harmonically together like G D A Bm. Start playing them evenly a few times. Then think of how you’d communicate those same four notes or chords according to a particular emotion like anger or fear or happiness. What you’ll find is that you’ll change the attack or shorten or lengthen a note or chord to fit the emotion. That is the basis of any form of communication. But just by doing that simple exercise, how you play those notes or chords are authentically yours because you’re translating what you’re feeling inside. Kind of cool, huh? Back in the early days of this blog, I used to look forward to news from NAMM, anxiously waiting with bated breath for quips and news articles from manufacturers and magazines. NAMM was always such an exciting time. But now? Not so much. It’s not that I’ve lost interest in gear. If anything, I’m even more interested in gear than ever (though I realize due to time, I just haven’t been able to write as much about it as of late).But I think what has happened with my attitude towards NAMM is due to a few things. First, I’ve found my sound. I know that whatever gear I play, I will sound like me. Talk about finding the tone unicorn. Because of that, I’m not as compelled to buy gear on a whim. Back when I started this blog, I was completely new to tube amps, and GuitarGear.org was my online diary of the gear that I was buying and trying. But as I started to find my sound, the list of things that I’d look at to help shape my tone narrowed significantly. It’s now at the point where I’m treating effects purely as that: effects. I don’t use them to achieve my tone, but to provide different textures as I need them. Second – and perhaps this may be erroneous on my part – I kind of feel that there are only so many ways to skin a cat, as it were, and so much gear that comes out simply seems to be a variation or incremental improvement over previous versions. That’s not to say that there isn’t some great gear that’s hitting the market. But my attitude – bad or good – doesn’t help compel me to dig as deep. Thirdly, my gear focus as of late has been on improving my stage and recording gear. Last year, I actually started having GAS attacks on some awesome guitars and effects I ran across. But life happens as they say, and I had to replace some road-worn stage gear, and I needed to upgrade my DAW for home recording. My next major purchase is going to be a Heil Sound PR35 mic for stage and recording. After doing a gig with the PR35, I just could not believe how good that mic sounded! The cool thing is that while it won’t break the bank, it’s definitely not cheap. Finally, I’ve just been too freakin’ busy with my career these last couple of years to evaluate gear. In addition to my day job as a technology architect, I still gig over 100 days per year, so my schedule makes it fairly prohibitive to research gear. I know, that’s probably not much of an excuse. But truth be told, I’m having the most fun I’ve had in my 30-year career as a software engineer that I’ve ever had, and I have to be honest, I’ve been pouring a lot of my energy into my career. So circling back to NAMM… I have seen some pretty cool things, but the things that have piqued my interest have been in the recording and pro audio areas; areas that are outside the scope of guitars. But despite that, I’m still a bit “meh” about the whole affair. I haven’t had much time to devote to GuitarGear.org in the last couple of years, so when I do post something, it has to be meaningful to me. And surprise, surprise… I got an email in my inbox this morning that kind of intrigued me. It was an announcement from Fender that they were releasing version IV of their popular Hot Rod Series of amps. To me, the two features that stick out are the pine cabinet and the preamp circuitry for better overdrive. In particular, the overdrive on the Hot Rod has been pretty weak in previous versions. In fact, I would rarely use the drive channel on my own amp, and just use the amp as a pedal platform. But if they’ve improved the overdrive channel, that’s intriguing enough for me to check out. I almost bought a Series III amp from my buddy a few years ago. It was much lighter in weight than my Series II, but the overdrive of the amp was simply, well, uninspiring, and way too open and choppy for my tastes. I even tried running the amp through a different speaker, and it still didn’t improve the sound. But if they’ve tightened it up with more note definition, this really gets me excited. What about the change to a pine cabinet? Damn! Not only would that significantly lighten the weight of the amp, it would make it much more resonant. I absolutely love pine cabinets. They just resonate so, so beautifully! Combine that with the silky smooth Fender cleans or even with some tight overdrive, damn! Yet again! Interestingly enough, with the Pro Junior IV and the Blues Junior IV, Fender has replaced the birch/plywood cabinet with MDF. Maybe it made more sense sonically to them; hard to know what a manufacturer is thinking. I can’t wait until that amp is available in stores so I can test it. But in the meantime, if you’re curious, you can check out the product page on the Fender site.